The identity of a vehicle starts with its chassis and the project team has been fortunate to establish that ours used to be B2737. From scrutinising witness marks (rivet holes) on both side rails, it is evident the chassis once carried a four figure LGOC fleet number starting with ‘B2’. In addition, a second set of screw holes overlaid on top show the remains of where a ‘National Omnibus and Transport Co’ number plate was once fitted. From researching company fleet records, only eleven ex LGOC double decker ‘B’ types starting with ‘B2’ were sold second hand to the National. Of these, just the numerals of B2737 fit all the remaining frame fixing holes in the correct order. Through answering this most intriguing question, it has been possible to research further the history of our vehicle. Within the depths of our archive there is an old leather bound ledger charting the allocation and disposal of a number of B-type buses. 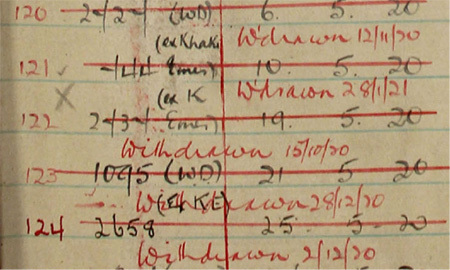 One page notes that B2737 was requisitioned for use by the War Department, not returning to the LGOC until 19 May 1920. It then served for several months as a ‘ Khaki traffic emergency bus’ before being withdrawn from London service on 28 January 1921. Another page notes that on 24 February 1922 our B-type chassis was joined with body number B2364, for onward sale to the National Omnibus Company. Whilst research is still ongoing, it is pleasing to note how a four digit number can help reveal such a wealth of information.